Gloomy skies over Canary Wharf's skyscrapers matched the mood of many workers rushing through the morning drizzle to their offices in London's financial district on Monday. Clutching newspapers and coffee cups, one after another said they were still in shock about the U.K.'s vote to leave the European Union. They're worried about their jobs and the future of banking and insurance in the city. "I am coming to terms with it, but I am still very disappointed and worried," said Matthew, 42, who works in insurance. He declined to give his surname. "We walked into something with our eyes closed, we didn't understand the implications...when I say we, I mean we the nation, I voted remain," he added. Matthew's job depends on the insurance industry's ability to sell its products in European markets. Financial companies use Britain as a springboard for their business throughout the EU, because they have an automatic license to operate across the bloc. But banks and other companies are now at risk of losing these rights. "Within our industry, all of this was very clear ahead of the vote, but I think it fell below the radar in the rest of the country," he said. 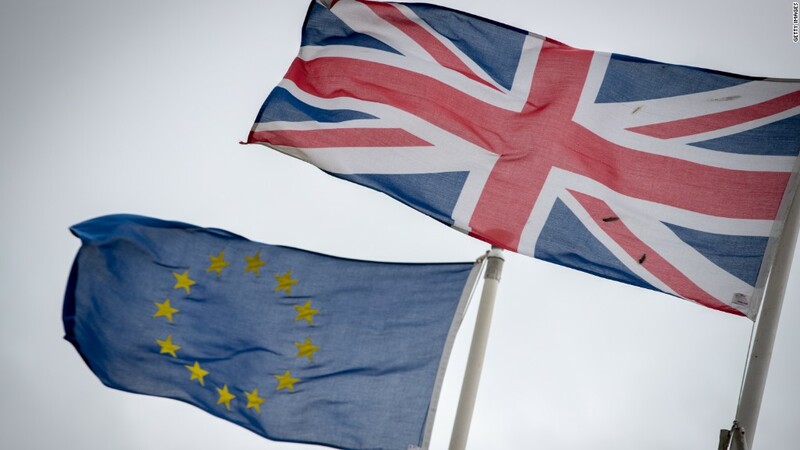 Thousands of jobs could go if access to EU markets is lost. Workers in Canary Wharf are acutely aware of that. "My job prospects have certainly not improved with the referendum," said Patrick, a 46-year old analyst at a big bank, who also voted remain. "We support the trading floor, so if their jobs go to Frankfurt, our jobs will go too," he said. "And I had my savings devalued by 10% last week," he added, pointing to the crash in the value of the pound since the Brexit vote. Finance and related services generates 12% of the country's GDP. Some big banks warned before Thursday's referendum that they could be forced to move jobs out of the U.K. if it left the EU. "We are all a bit worried about this, our jobs depend on our European clients," said Lisa Koh, a banker at JP Morgan (JPM). As an Australian resident in London, Koh was able to vote. She chose remain. Among other reasons, she was hoping that once she qualifies for British passport, she and her family would be able to enjoy the benefits of European citizenship -- being able to live and work in any EU member state. Stocks and the pound plunged again on Monday. Banks were among the worst hit, adding to the grim mood. 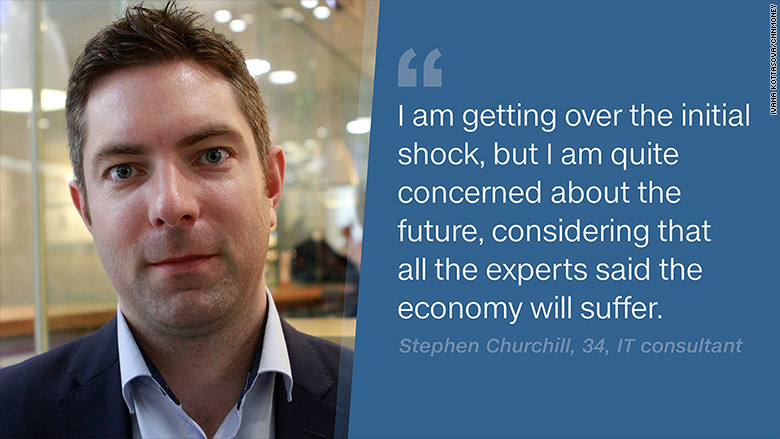 "I am getting over the initial shock, but I am quite concerned about the future, considering that all the experts said the economy will suffer," said Stephen Churchill, 34 year-old IT consultant.